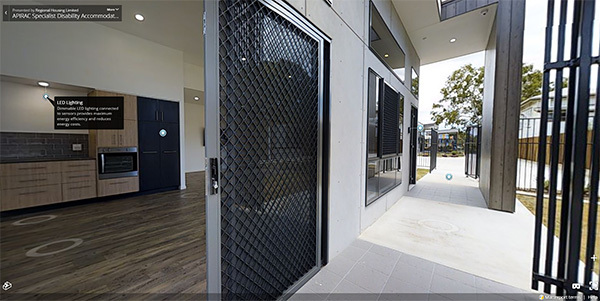 Regional Housing Limited develops and manages innovative specialist disability housing units, bringing ultra-modern state-of-the-art housing for people living with disability to Bundaberg and the greater Wide Bay district. This award winning housing takes accessibility and adaptability to the next level by combining smart and modern (standards based) design, integrated home automation, and customisable assistive technologies to create greater independence and provide a higher quality of life for residents. RHL’s specialist disability housing model delivers adaptable and accessible building design, customisable home automation features and integrated technology infrastructure which accommodates the installation of individualised assistive technologies. For someone living with disability these features provide much more than simple convenience and can often provide the key to greater independence. By bringing together a range of lifestyle technologies and creating an accessible and adaptable living environment, this accommodation empowers residents living with disability, fosters their independence and raises their overall quality of life. The customisable nature of our integrated technology system and adaptability of our design is based on extensive sector and community consultation, and means that each unit is capable of meeting the extended needs of a varying range of disabilities. Enjoy a virtual walk-through of some of our completed units and discover the innovative accessibility, design and technology features that make our specialist disability housing unique. 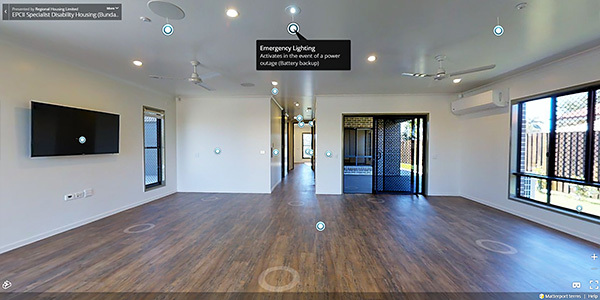 Click on the link below to open the virtual tour and use your mouse to move around. Point and click where you want to move and look around with a full 360 degrees of freedom. Following a successful tender in November 2014, RHL received one-off Capital Funding from the Queensland Government’s Department of Communities, Child Safety and Disability Services under the Elderly Parent Carer Innovation Initiative (formerly known as the Elderly Parent Carer Innovation Trial) to design and build two state-of-the-art specialist disability housing duplexes on separate sites in Bundaberg. This $1.4 million project was funded to deliver practical, innovative, state of the art housing for four individuals living with disability and being cared for by an elderly parent. RHL completed the first of these EPCII duplex developments in June 2016 and has already shared our experience and learnings from this build with a number of like-minded organisations from all over the state, the disability sector (both within and outside of government), and the wider Bundaberg community. Our Community Open Day in July attracted over 50 participants who took up the opportunity to tour the finished units and experience first-hand RHL’s innovative approach to specialist disability housing. The feedback from this event and the many tours provided in the weeks following completion was overwhelmingly positive, re-affirming our belief that this accommodation is unique and potentially life-changing for someone living with disability. Our second EPCII duplex development was completed in August 2016 and benefited greatly from the lessons learned and feedback received during our first build. Building on our Elderly Parent Carer (EPCII) unit design and learnings from ongoing construction, RHL successfully secured funding under the Accommodation for People with Disability in Residential Aged Care or Public Health Facility (APIRAC) in October 2015 to construct two new duplexes of similar, but even more accessible design. Construction on these projects (worth a total of more than $2 million) was completed between November 2016 and January 2017 delivering four additional purpose built units of accommodation (each containing 2 fully accessible bedrooms and bathrooms) at separate locations within Bundaberg. These projects allowed RHL to further develop its ultramodern, state of the art disability accommodation model to meet the needs of people living with disability who require higher levels of care. If you’d like to know more about RHL’s disability housing you can contact us on 1300 642 123 or email info@regionalhousing.org.au.